LAGOS, Nigeria — Cars snaked out from the hideous traffic and deposited the city’s elite, dressed to impress, at the Civic Center, a concrete-and-steel edifice fronting Lagos Lagoon. Women exuding Vogue beauty and power paused on the patio to give television interviews. Art X Lagos was living up to its reputation as a happening. Not just collectors, but the hip, the curious, the Instagram crowd, thronged West Africa’s principal fair in November. They packed the venue to hear the keynote talk by the distinguished British-Nigerian artist Yinka Shonibare, back for the occasion. The Ooni of Ife, a Yoruba king, showed up, escorted by praise-singers. Conversations carried over from gallery openings around town and from the Art Summit, a two-day convening, where the celebrated painter Kehinde Wiley, flown in by the United States consulate, was a special guest. This enormous city — with no official census, population estimates range from 13 million to 21 million — is dynamic by disposition. Yes, the roads are clogged, political corruption is rampant, and the power cuts trigger armies of generators spewing noxious fumes. But Lagosians — who are proud of their “hustle,” a mix of effort, imagination, and brash optimism — will turn any challenge into enterprise. Commerce, music, fashion, have long thrived amid the chaos. And now, with its solid collector base and thickening web of galleries and alternative spaces, the art “ecosystem” — the word everyone uses — is achieving critical mass. Beginning in October, a succession of festivals — devoted to literature, poetry, photography, theater, fashion — cascade into the party-filled holidays. Art X, just three years old, is already a mainstay of this cultural season that has sprung up without any coordination. This fall it will overlap with the Lagos Biennial, a scrappy grass-roots affair that began in 2017. Nigeria has had art movements before — the Zaria Rebels, who unleashed Nigerian modern art in the late 1950s, or the Yoruba modernism of the Osogbo school, to say nothing of sculpture, textile and performance traditions. Recently, Nigerian contemporary artists have found success abroad. Works by the painter Njideka Akunyili-Crosby, based in Los Angeles, have sold for upward of $ 3 million. The Berlin-based sound and installation artist Emeka Ogboh was a finalist for the Guggenheim Museum’s 2018 Hugo Boss Prize. The Lagos scene, however, joins homegrown artists with those who lived or studied abroad but moved back, inspired to create amid the energy of the city. “You have more people who know they can actually survive as artists,” said Victor Ehikhamenor, a painter and sculptor who returned here from the United States in 2008, somewhat ahead of the curve. Gerald Chukwuma, a Nigerian sculptor in his 40s, showed new work at the fair with the Ghana-based Gallery 1957, which has a Pan-African roster. His theme was Igbo Landing — the story of enslaved people from what is now Nigeria, who, upon disembarking from the Middle Passage in the Sea Islands of Georgia in 1803, walked back into the ocean in their chains rather than submit. Mr. Chukwuma said few Igbo in Nigeria know the story. “We have to retrieve this culture,” he said. Art X is of comparable scale to the Africa-focused contemporary art fairs 1-54 (held in London, New York and Marrakesh) and AKAA, in Paris. But whereas those fairs address international collectors, Ms. Peterside, who holds an M.B.A. and is the daughter of a prominent banker, began the Lagos event as a cultural investment in the city and a business bet on Nigeria’s burgeoning collector class. GENERATIONAL RENEWAL and art-world globalization are shaking up habits in the Lagos gallery scene. Galleries here traditionally worked with artists in nonexclusive arrangements. Some are tucked away in fancy residences or open by appointment. It made for a small, in-the-know collector base and left artists feeling vulnerable to dealers’ whims. Augury of change came in 2007, when the curator Bisi Silva founded the Center for Contemporary Art, which pioneered contemporary exhibitions and residencies. The next year, Kavita Chellaram, a collector from a prominent Indian business family, opened Nigeria’s first art auction house. Its sales made prices visible for the first time. Now, young gallerists like Adenrele Sonariwo, at Rele Gallery, and Caline Chagoury, at Art Twenty One, are engaging with their artists’ careers, and encouraging new audiences. Ms. Sonariwo operates on multiple fronts. She holds an annual Young Contemporaries showcase of artists she scouts herself; this year’s edition is currently on view. In 2017, she was a curator of Nigeria’s first pavilion at the Venice Biennale. The Art Summit was her initiative as well — an effort, she said, to gather the “ecosystem” around a sense of shared interests, centering on the artists. At Olu Amoda’s workshop in the Maryland area, a residential tangle on mainland Lagos away from the city center, an enormous work in progress hung from a 20-foot gantry. Mr. Amoda sculpts intricate geometric works using reclaimed metal, from keys and springs to industrial pipe. His assistants work nearby. Two are deaf-mute. “They teach me patience,” he said. Like many veteran artists in Lagos, his practice is in effect a small business, with staff and contractors often supporting families in the countryside. Artists like Mr. Amoda, who is 60, remember a relatively functional Nigeria of the 1970s, but began their careers later, under dictatorship and economic crisis. By 1999, when democracy returned, many had scattered or changed professions out of necessity. Some toughed it out, among them Mr. Amoda and his friends, the painters Rom Isichei and Kainebi Osahenye, whose studios are nearby. This generation takes in the current buzz with a level of detachment. “I’m working now just for my daughter, and for my studio,” said Mr. Amoda, who is collected locally but has fallen short of major international recognition. Nevertheless, he has entrusted his sales to Art Twenty-One. Mr. Osahenye said he avoided thinking about money. “There are times you sell a piece and the next day it’s in an auction at 10 times the price,” he said. AMONG THE MANY HURDLES is the lack of institutions. State support for the arts disappeared in the 1980s. The National Museum is a hollow shell. It rents out space where anyone who pays can hold an exhibition. A museum sponsored by Yemisi Shyllon, one of Nigeria’s biggest collectors, is under construction at a private university. “Once one is built, the others will follow,” Mr. Oyebode said. Other complaints involve logistics. Customs is a hassle. The traffic can turn a simple delivery into a nightmare. But the problems also exercise a creative draw. Sprawled between lagoons and the sea, Lagos faces high risks from climate change. The artist Temitayo Ogunbiyi is collecting flora from the lagoon to use in environmental pieces. She is designing playgrounds, with equipment inspired by the shapes of elaborate Yoruba hairstyles to remedy the lack of public leisure spaces. The painter Nengi Omuku, whose works of abstracted, fragmented self-portraiture explore mental health and fractured identities, is organizing the renovation, by artists, of a building at the city’s main psychiatric hospital. Though she has lived in England, Ms. Omuku said she couldn’t imagine staying there. A BACK STAIRWELL in a shopping mall hosts one of Lagos’s sharpest artist-run spaces: The Revolving Art Incubator, in the Victoria Island business area. It is a vertical project, making an exhibition and event site of steps and landings. Lately a gargantuan wood figure wearing a cap has dangled three stories down in the stairwell, with small counterparts on the landings. They represent the “godfathers,” or bosses, who dominate Nigerian politics. Hundreds of comments found on Twitter on the state of Nigeria were fastened on slips of paper to a wall. Upstairs, old televisions ran footage of each of Nigeria’s past heads of state. Their sound was off. Instead, speakers played clips of animated bus-stop debates. His installation will run at least through Nigeria’s general election, on Feb. 16, in which former Vice President Atiku Abubakar, a politician and entrepreneur, opposes President Muhammadu Buhari. Lagos, which often feels like its own bubble, elects a new governor two weeks later. The incubator holds artist talks and poetry readings, with the audience on the stairs and leaning on railings. Office workers hang around, waiting for the traffic to dissipate. “There’s something organic about it,” said Jumoke Sanwo, the space’s founder, whose goal is to help emerging artists manage their careers. 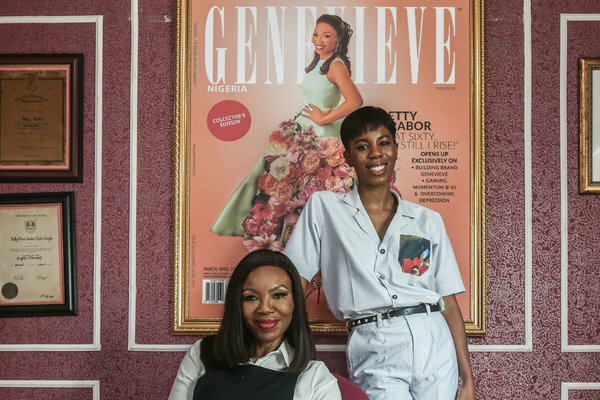 Seven floors above the busy Awolowo Road in Ikoyi district, Wura-Natasha Ogunji has turned her airy apartment in a worn middle-class complex into The Treehouse, an art space with a sweeping view. Ms. Ogunji, who is Nigerian-American, moved to Nigeria in 2011, despite barely knowing that side of her family. “I had a sense of a magical life,” she said. She began to host dinners and eventually, art happenings. Once, the photographer and conceptual artist Rahima Gambo hauled up 45 palm trees, complete with dirt. Another time, Tito Aderemi-Ibitola, a performance and video artist, enacted a five-hour endurance piece. Ms. Ogunji puts out the word on social media. “It’s always a different crowd,” she said. People were squatting in train cars. Security involved negotiating with “area boys,” street toughs who control neighborhoods. The state government tried to clear out the informal settlement. “Of course the people went back,” Mr. Oshun recalled. This year the biennial will return in a new location, perhaps slightly tamed, with three Nigerian curators based in Chicago, London and Lagos. Its theme is the metaphor, found in a poem by Akeem Lasisi, of the lagoon flowing out of a bottle of wine. “You work with what you have and make the most of the culture,” Mr. Oshun said. The Lagos hustle is art in itself.